One of our friends is expecting her second child for around Easter, and that gave me the chance of trying my hand at something new : making toys. It was a completely uncharted territory for me, but I think I managed rather well, if I may say so myself. I first made the gift for the soon-to-be-born baby. I was advised by some wise folks on Ravelry to go for a lovey-type toy, so it would be easy to grab for the tiny fingers of a new-born infant. I chose to make him or her (the parents opted not to know the gender of the baby beforehand) Barbara Prime’s Flat Foot Floogie, in the rabbit version, because it was so cute and a good compromise between an animal-shaped toy and a lovey. Flat Foot Floogies have a flat, garter stitch body with stuffed paws, tummy and head. And did I mention they’re so cute ? I’m now looking for a baby who might appreciate the lamb version. I have to say a few words about safety here. At first I was concerned with the stuffing possibly getting out of the stuffed parts through the stitches (I was imagining the baby sucking at it and getting fibers in his/her mouth). I was advised to line the stuffed parts with something like old stockings in order to prevent that from happening, which I did (with clean old stockings, obviously. I’m the kind of girl who washes and keeps her old stockings, thinking that they might come in handy some day — and I just proved myself right). I think it will do a good job of keeping the filling inside the toy. But I now have misgivings of another kind. The old stockings are nylon, and the filling is polyester, which means that my cute lovey is a potential fire hazard (that goes also for the Monkey, knitted with acrylic yarn while the Floogie is made with merino wool). I’m sure our friends are responsible parents who don’t set toys on fire before giving them to their children, but still, accidents happen. I can’t help remembering a birthday party where I had been invited as a little girl, when the birthday girl’s favorite pink nylon sweater caught fire because of the firework candles which had been set on the cake (everyone reacted pretty quickly and she was scared but unharmed). Then again, maybe it wasn’t a very good idea to use them in the first place. So, I decided on writing a little warning note along with the care instructions, and trying to find safer materials for next time. When I finished the Flat Foot Floogie, I thought : “That’s too cute. Big brother J will be jealous if he doesn’t get his own cute and cool toy”. 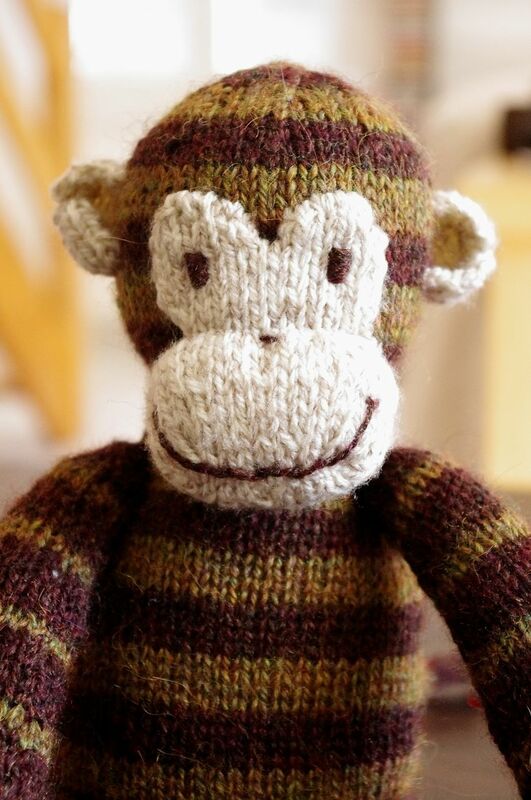 And this is how I went to look in my stash and casted on Sarah Keen’s Monkey, which I chose because monkeys are cool and because this particular monkey had such an endearing little face. 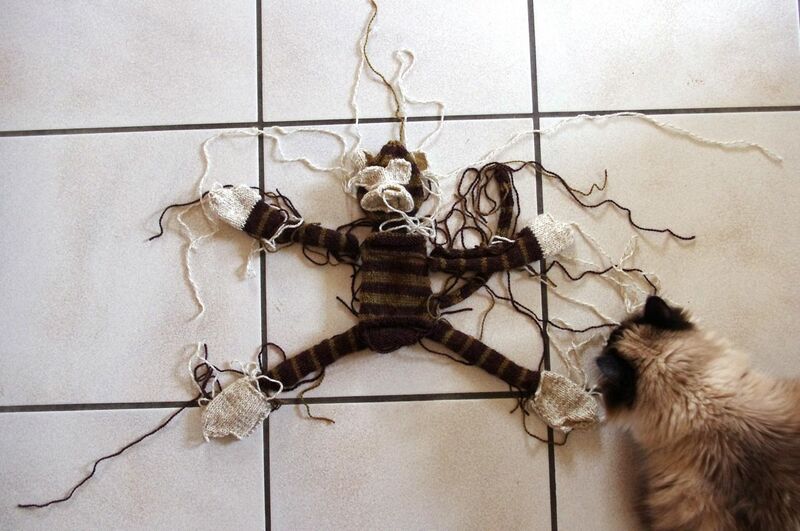 I didn’t have enough yarn of a single colour to make the darker body parts, so it’s striped. Never mind. I’m sure green and brown striped monkeys blend in better with their environment, and thus have a longer life expectancy. This little fellow took me much longer to make than the Floogie. It’s made of rather a lot of different parts (I counted 15, and that’s without the additional banana which I chose to skip).The knitting part was easy, but I couldn’t help feeling somewhat intimidated when the time came to sew it together. So many bits and pieces ! So many ends waiting to be woven in ! Just assembling it (closing the side seams, stuffing, sewing the right body parts in the right places) took me longer than actually knitting it. But I did it in the end, and I even think my sewing doesn’t look too bad, which is quite an achievement for me. I still managed to get the ears wrong (I forgot to fold them in half and sew the side seam), which I justified by declaring they look more like actual monkey ears that way. Now the next step for these two lucky critters is to head to warm and sunny Southern France, where their new home is waiting for them. I was a bit surprised to realize that, while I’m perfectly happy to send the Floogie away (it’s so clearly a baby toy), I wouldn’t mind keeping the Monkey. 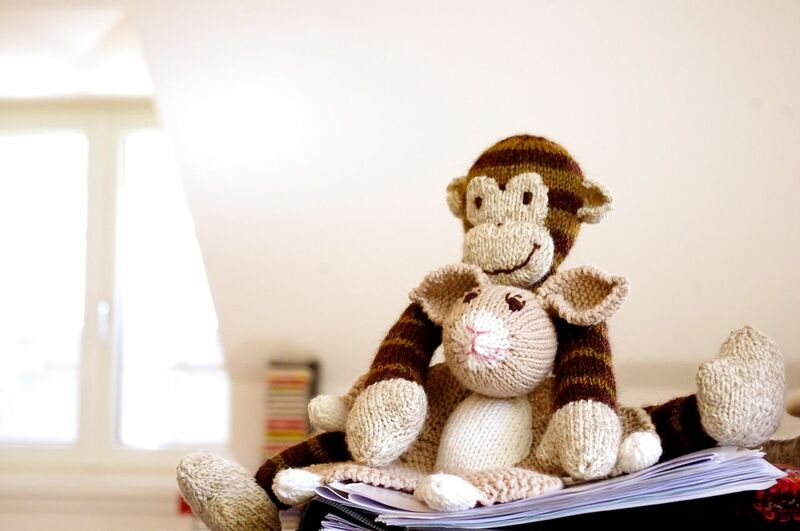 In fact, I’m half considering to tell my friend to send it back, should little J not like it — and I do hope Monkey will be loved and cuddled and carried everywhere till it falls apart. (That’s an image of speech. I took such pains to sew it together solidly that I’m firmly expecting it to be as good as new when J will give it to his grandchildren.) And I’m not the only one who finds it so endearing. 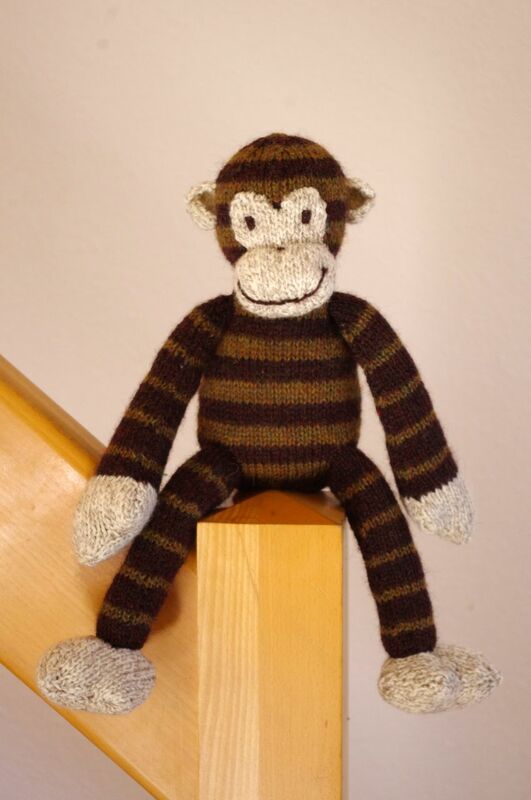 Yesterday evening, when Monkey was still half-finished, legless and tailless, my husband fondled it and asked a bit shyly : “Would you knit me a toy if I asked you to ?” Why, of course I would — and maybe one for myself too ! 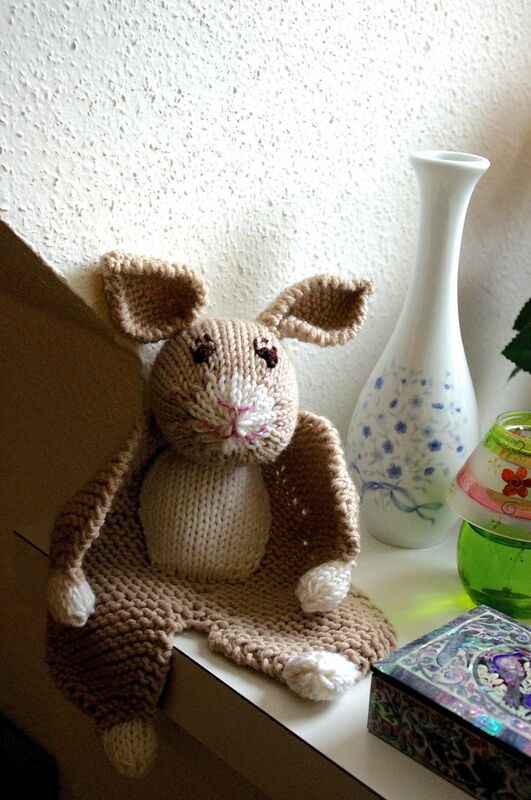 This entry was posted in Finished Knits and tagged toys by Julie Paik. Bookmark the permalink.